Essentially the World Health Organisation recommends 5-10% of total energy to come from Free Sugars. 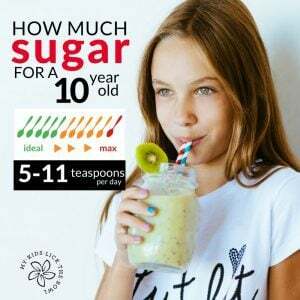 They specify everyone should have less than 10% of their energy from free/added sugars and suggest that a reduction to 5% could have additional health benefits. 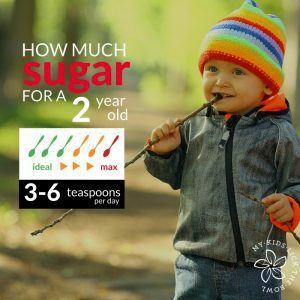 How do GOODNESS ME FRUIT STICKS compare to the WHO Sugar Guidelines? The new visual will always specify the amount of the food that is being compared. In this case it is 1 Fruit Stick. In the case of ‘GOODNESS ME FRUIT STICKS although there is no red light for any of the age groups. It does pay to remember that the visuals represents a full days sugar intake. 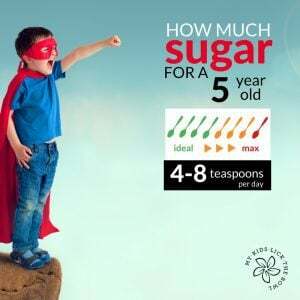 So a very small bar/snack item could contribute a significant amount of sugar to a child’s daily intake. Fresh fruit and no added sugar dairy products are great nutritious foods that kids should be encouraged to enjoy. So where do I stand on GOODNESS ME FRUIT STICKS? For me this product does not tick the first box on my list. The sugar content in the Fruit Sticks is not making a really nutritious food more palatable. This product doesn’t add a huge amount of nutrition to a child’s diet. They contain no: Fibre, protein or healthy fats, which means this product definitely fits into my second check box. It provides no other useful nutrients so it should not be an every day food. As I said earlier, I am not a Sugar Nazi so if this product was part of a treat occasion or special event I wouldn’t say no. If we were at a play date and all the kids were having them, of course my kids would join in on the action! To be completely honest though, I kind of have higher aspirations for the type of sugar laden food memories I want to create for my kids. I want them to actually have fond memories of food. Things like: Fish and Chips at the beach. Real scoop ice cream from the dairy on the way home from swimming. Sugar laden birthday cakes. Licking the spoon when I am baking Anzac biscuits. Swiping chocolate cookies off the cooling rack because they think I haven’t seen. Hot chocolates after stomping in muddy puddles. Those sorts of things. So for me GOODNESS ME FRUIT STICKS won’t be in my supermarket trolley on any regular basis. Despite wording on the pack such as “we are all about the good stuff” , “100% Vegetarian Friendly” and “Allergy Free” none of these catch phrases actually make them a healthy choice. If you are looking for Healthy Kid Snack Ideas or Lunch Box ideas then be sure to check out those sections on my site. I am upgrading my sugar gallery at the moment it will be growing and improving and will soon become a fantastic visual reference library. Please bear with me as it improves! Feel free to have a peek, but believe me it will be much improved soon, with new visuals, many more foods and indexing by food categories. Do your kids eat these sorts of things? Do you agree, disagree, like or hate this post? Either way let me know what you think!